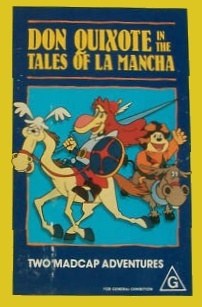 Don Quixote: Tales of La Mancha is a Japanese anime series produced by Ashi Productions. The show takes the central theme of the novel chronicling Don Quixote's attempts to win the heart of Dulcinea from the classic novel by Miguel de Cervantes. It was first run on Tokyo Channel 12 in 1980. In the 2nd episode "Witches Prefer Knights" Don and Sancho running from evil witch queen in her castle get to room like Escher's Relativity. Screenshots from the episode you can see below. 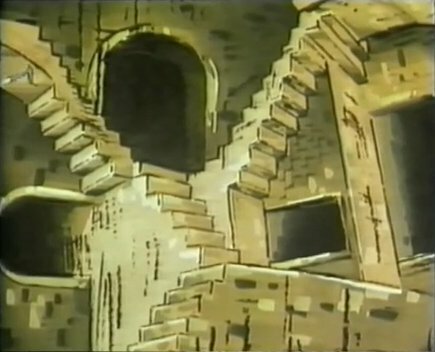 More information about the episode you can read at http://www.anime-games.co.uk/VHS/anime/don_quixote.php.